Everyone loves popcorn! It is the perfect snack food that can be really good for you. But let’s face it movie theater or microwave popcorn is not healthy! Here is how we make our popcorn that tastes great and is healthy too! Heat oil in heavy bottomed large pan on medium, stainless steel or cast iron work well. Put three kernels of corn in and when all three pop, remove pan from burner and carefully remove popped kernels with tongs. Then quickly add your remaining kernels. Wait 30 seconds while you swirl them all on hot oil. This allows all of the kernels to heat up to nearly popping. Then return to still hot burner on medium and pop till it slows to almost stopped. Remove pan from heat quickly to avoid scorching. 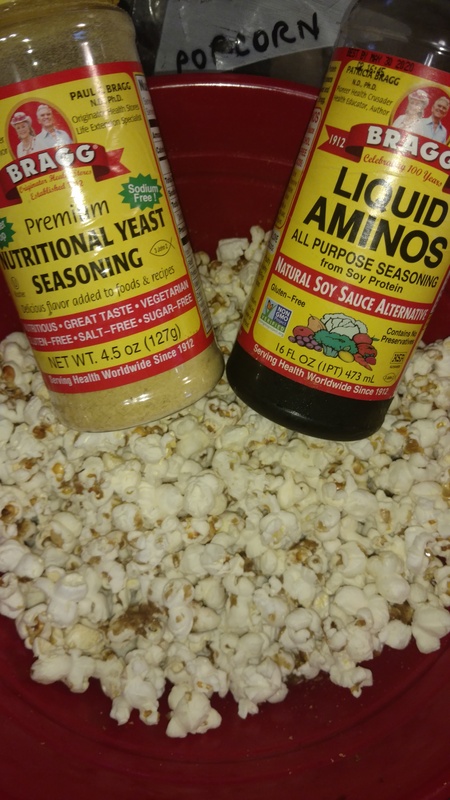 Pour popcorn in large bowl and sprinkle with Aminos and Yeast along with any other flavor add ins your family enjoys. Now enjoy your healthy snack with the family!